Ever since I was a small child I loved the sound of the Amtrak F40 horn (which is the Nathan/AirChime K5LA). I had always dreamed of having my own K5LA, but never thought it was possible. I did what I thought was impossible in November 1998... I was then the new owner of a used K5LA. I restored it and got it looking and sounding sweet. I then accomplished another goal: having a complete train horn setup on my 1999 Dodge Ram pickup. On this page I will hopefully help you learn more about train horns and explain how I got them on my truck. If it weren't for the extra special help of my friends Gary, Doc, Elwood, Chuck, John, and all of the other great guys in the Horn & Whistle group, I wouldn't have been able to make any of this possible. Thanks guys! I rebuild and sell horns for various short line railroads as well as collectors. If you are interested in having me rebuild or find a horn for you, please contact me at: mdamttc199@aol.com Please understand that this is a great hobby, but it is to be treated seriously, and with the proper respect. Permanent hearing loss will result from unsafe use. I treat horns like musical instruments, but one must remember their main purpose is to be used as warning devices. There are only two main manufacturers of locomotive horns in the business today. 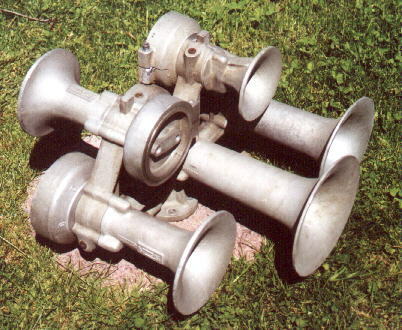 Nathan/AirChime horns have become the common voice of the railroads, but Leslie Supertyhon horns are still heard, however in decreasing numbers. Below I will be adding pages for the most common types of horns seen and heard today. K5LA, P5 new cast, and a S3L on CSX locomotives saluting eachother, recorded in the cab of a GP38-2. Comparison of the Old Style P5(C#, E, G, A, C# octave) , and P5LAC (C#, F, G#, A#, C# ocatave). The lower pitched horn is the Old Style P5. Leslie S5 on a CSX dualing my friends K3LA. As I mentioned before, I added a train horn setup to my truck. It is something that only a handfull of people that I know have in the world. I wouldn''t suggest this for everyone to do, as it is something that requires lots of restraint. There's been many times where I would like to blow my K5LA at some jerk that has cut me off, but I don't as it could cause a serious accident. 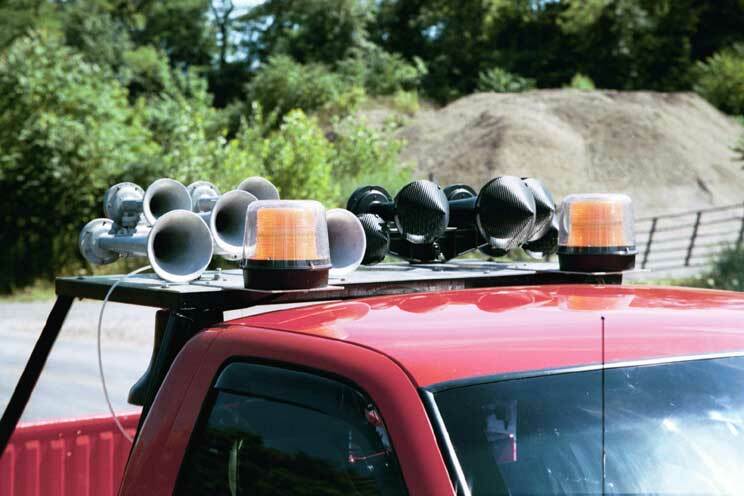 My main reason for having this on my truck is because it is a great mobile horn testing setup. Due to my rebuilding of horns for collectors and shortline railroads, I have the need to go out into the country to really test out a horn. On the fun side of things, I used to blow my horns at the local high school's football games when the team scored. I was asked to do this by the principal and the head of the athletics department! My truck is rigged up with a 60 Gallon air reciever that I bought from Ingersoll-Rand, and a custom built horn rack that was modeled after my friend, Doc Bryant's setup by a local welding shop. The top plate on my rack is aluminum (so it wont rust and I dont have to worry about painting it). I can mount one horn in the middle, or two horns, one on each side of my truck. I have a fill station that has a male quick disconnect fitting to be filled by a home compressor, a standard tire chuck, and air filter. I have two locomotive horn valves to blow my horns. One valve is located just outside of the rear window, and the other I had mounted next to the steering wheel. I could use a solenoid and install a push button to actuate the horns, but I prefer having full control over how loud of a blast I want to blow. A solenoid valve is stictly "on/off," whereas the manual valves allow me to control how much air is going the the horn. All of my connections to the horns are 1/2" air line. Volume is extremely important for these things. Besides the horns I have a pair of Star 200-BC strobes, which are the same kind used on Amtrak (but they have white lenses), and a locomotive bell on the truck. Top View of my truck. View of the horn valves in action. Elevated rear view of my truck. Overhead view of the horns mounted on the rack. Closeup view of the bell, showing solenoid beneath which actuates the bell..
Closeup of the entire setup. I had adjustable back caps made for my K5LA by Chuck Blumley. He took at look at one of Fred Berry's adjustable back caps made by AirChime (who not longer makes these) and was able to scratchbuild one, then find a shop to reproduce them. With these back caps I can adjust any horn to sound in any order. I can even set my horn to blow with only lung power! My PSI regulator is attached to one of the air lines so I can choose to conserve air if I choose. I don't have an onboard compressor, so I just let the 60 gallons drain and then refill. Another custom addition to my horn are the snow-cones who were made by a friend that works for Amtrak. Horns are often clogged, distorted, or outright messed up because of either bugs, exhaust, or snow. Amtrak makes "snow cones" for their horns, and some frieght railroads use nylon covers. Pictures of each are at Horn Protection section of my page.